Ballard Power Systems has announced the development of a next generation high performance fuel cell propulsion system to power unmanned aerial vehicles (UAVs), or drones. 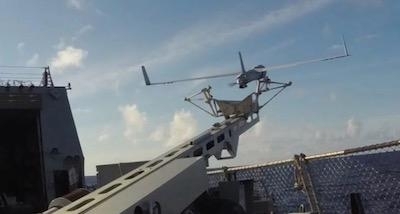 Ballard has also received a follow-on contract from Insitu, a Boeing subsidiary, for extended durability testing of the next-generation 1.3 kilowatt (kW) fuel cell propulsion system to power test flights of its ScanEagle UAV platform. Ballard and Insitu have partnered over the past two years to integrate Ballard’s prior generation fuel cell propulsion system – a complete hydrogen power system for small unmanned fixed wing and Vertical Take Off and Landing (VTOL) platforms – into the ScanEagle platform. Successful flight testing was announced in mid-2017. The next generation fuel cell propulsion system announced today delivers a number of important advances: increased power density, resulting from a new membrane electrode assembly (MEA) design; reduced cost, resulting from a combination of new MEA and one-step fuel cell stack sealing process; and extended lifetime. The increase in rated power, without any appreciable increase in size or weight, is a particularly significant development for UAV applications. Fuel cell propulsion systems offer a number of advantages over ICE-powered drones (refer to accompanying chart). In addition, fuel cells offer a 3x increase in mission time compared to battery-powered drones. Insitu’s ScanEagle is a versatile platform with multiple payload capabilities, including high-definition imaging, at a fraction of the cost of larger UAV systems. Insitu’s platforms have logged more than one million flight hours in military and civilian applications, making ScanEagle the most proven UAV in its class. The ScanEagle is operated in conjunction with Insitu’s Mark4 Launcher – a low-maintenance, runway-independent platform – along with its SkyHook recovery system. ScanEagle is 5.1 feet in length, has a wingspan of 10.2 feet and maximum takeoff weight of 48.5 lbs. The UAV can fly at a maximum speed of 80 knots and reach a ceiling of 19,500 feet. In addition to military use, the commercial market for drones is expected to growth significantly over the next few years, from 0.25 million working drones in 2017 to more than 2.5 million working drones by 2021. Applications are anticipated in such areas as agriculture, construction, environmental management, urban & rural surveying, mining, emergency response and law enforcement.